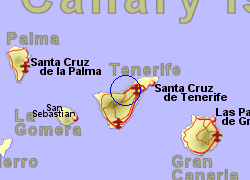 Puerto de la Cruz, situated on the north coast of Tenerife, is an old cosmopolitan city that has been a tourist destination for over a century, yet has not become a concrete jungle. The city lies in the Valley of La Orotava, an area which has lush vegetation and plantations of tropical fruit, overlooked by Mount Teide, at 3,718 m (the highest point in Spain). The city itself has several gardens worth a visit, some of historic importance, including the Botanical Gardens, dating from 1788. The attractive old town, which was originally a fishing port has narrow cobbled streets and you will find bars and restaurants that are frequented by locals together with tourists. 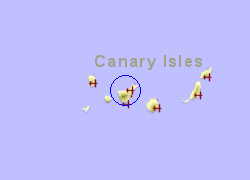 The city has small beaches of volcanic sand, typical of the Canary Islands, however a favourite bathing area is the Lago Martianez complex of artificial seawater pools. 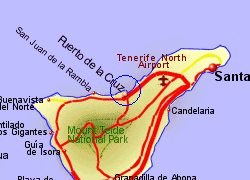 Map of the Puerto de la Cruz area.